Taiwan's leading manufacturer and exporter of Communication Antennas. 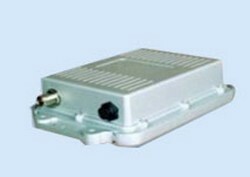 APR-108WB is an AP / Bridge / AP Client is designed for harsh outdoor environment and operates in the 2.4GHz or 5.8GHz band compliant with IEEE 802.11a/b/g Standard. With High Power 200mw in 11a mode and 400mw in 11bg mode. APR-108WB supports a data transmission rate up to 54Mbps, with Turbo mode up to 108Mbps that is best suited for Enterprises, Campus, Airport or off-site location required LAN or Internet access without effort of networking wired cabling issue. APR-108WB AP Bridge provides 802.11a/b/g Dual band to support point-to-point, building-to-building or point-to-multipoint applications through its wireless Distribution System, WDS. It contains a high gain performance via its external N-Type connector for any other type of Antennas such as 12/15/18dBi Patch Antenna or other Omi Antenna. For easy outdoor deployment, APR-108WB supports Power over Ethernet feature to create more wireless backbone networks without the environment limitation. It also provides advance security enhancement with up to 128-bit WEP, WPA, WPA2 and MAC address filtering. 1. Support operation mode Access Point, Bridge and AP Client Function. 2. Support operation mode for Enabling or Disabling Turbo Mode to enhance the data rate up to 108 Mbps. 3. Support bandwidth and SNMP Management control. 5. Support web-based, Telnet and Utility Management. 6. Seamless Wireless Connection to eliminate the need for cables, extra switches and routers to interconnect wireless nods. 4. Connector Type: N Female or Reverse N female. 5. Operating Environment: Operating Temperature:-30 ~ +70°C Storage: 0　C ~ 70　C ambient.